Raising the pitch of its campaign on the triple CD issue, the Congress today staged state-wide protests to press the demand for a registration of an FIR in the and a CBI probe in the matter. In statewide anti-corruption day protest, the Congress men today held protest in all 10 assembly segments in the district and demanded dismissal of Chief Minister PK Dhumal, suspension of DG (vigilance) DS Manhas and MP Virender Kashyap in connection with the CD issue. They also demanded a CBI probe and lodging an FIR in the case. It was a day of protests here as both the CPM and the Congress activists held protest demonstration at different places, separately. The Himachal government will hold a minister-level meeting with the Punjab government on February 3 in Chandigarh to discuss ways and means to improve road connectivity between the two states and issues pertaining to maintenance of national highways of various inter-state road projects. To avoid unnecessary litigation in the courts and speed up road construction in the state, the government has decided to secure prior land donations from residents for all private lands required for construction of roads by government agencies before taking up the construction work. In its state-wide protest against failure of the Centre and the state government to curb price rise, the CPM-CPI today burnt a symbolic effigy of price rise and demanded that the government should release 35 kg of rice and atta at subsidised rates to ration card holders immediately. It also asked the Centre to increase ration quota for the state. The State Ex-Servicemen Welfare Action Committee (ESWAC) has decided to approach President of India Pratibha Patil and Defence Minister AK Anthony over the alleged donation of Rs 1 crore of sainik welfare fund to the CM relief fund by the director of the Sainik Welfare Board and Hamirpur DC Abhishek Jain. The state Bahujan Samaj Party (BSP) held the government responsible for the difficulties and problems of people of the state and said all sections of society, including the unemployed youth, weaker sections, women and farmers had been betrayed by the government. The CPM today organised protests across the state to highlight the issue of price rise and expose the failure of the UPA regime at the Centre and the Dhumal government in the state to take remedial measures. Keeping in view the growing demand for technically qualified manpower, the state government is paying special attention to upgrade the infrastructure for technical education and reviewing the conventional core curriculum to help introduce new skills and trades. Ten inspectors, deputed by the Medical Council of India (MCI), would inspect one department each of Dr RP Government Medical College, Tanda, this week to give concurrence for the 21 postgraduate seats in 10 departments of the college. The MCI has already granted an approval in principle to Tanda college for holding the postgraduate courses in the departments from the next session. Envoys of the Dalai Lama returned to Delhi today after talks with representatives of the Chinese leadership, a spokesman of the exiled leader here said. Led by CPI state assistant secretary Pravesh Chandel and district secretary of the party Diwana Ram Chaudhary, CPM district secretary Lakhan Pal Sharma and Himachal Kisan Manch spokesman Kesh Pathania, a large number of activists of these organisations shouted slogans against the ever increasing prices of essential commodities here today. Agitation by Congress activists turned ugly when the police tried to prevent them from burning effigies of Chief Minister PK Dhumal at Kullu, Manali, Banjar and Nirmand in this district today. Despite strong police struggle, the Congress men burnt the effigies though they had to face criminal cases (143, 147 of the IPC) registered against them. The Nehru Yuva Kendra Sangathan will organise a National Integration Camp from February 16 to 22 at the Udaseen Asharam, Banuti, here, in collaboration with the Youth Services and Sports Department. The BJP has ridiculed the “anti-corruption day” observed by the Congress today as an exercise in double standards. A massive fire which erupted at the unit I of Birla Textiles in the wee hours today led to a loss of Rs 1 crore as machinery and raw material was burnt down. It was a sudden short circuit, which occurred in the blending machine around 4 am, which led to the fire. Three members of a family, including driver, were drowned when a private tipper (truck) in which they were travelling plunged into the Ravi, near Choori village, on the Chamba-Bharmour highway, 20 km from here last night. The Himachal Pradesh State Subordinate Selection Board has granted an exemption to all applicants for the posts of lecturer in the Science and Arts streams from BEd degree. The party observed anti-corruption day today to highlight the CD scandal and exposing the BJP on the issue of graft. Leader of the Opposition Vidya Stokes and Pradesh Congress Committee chief Kaul Singh led the state-level protest in Shimla. Launching a scathing attack on the government, Stokes said the Dhumal regime had become synonymous with corruption and the video CD featuring BJP MP Virender Kashyap had made it evident that there was no dearth of Bangaru Laxmans in the party. “Cash in camera” was part the BJP’s culture and it was not a coincidence that a majority of the MPs caught accepting bribes in camera belonged to the party. She said Kashyap should have resigned on moral grounds after the exposure but instead entire party and even high command had come out in his defence. She said it was a very serious matter and the Congress would take up the matter with the Lok Sabha Speaker and demand action against Kashyap. It was shocking that instead of accepting the truth and making amends the BJP was trying to hush up the matter by conducting a facile inquiry by the CID. She recalled that similar strategy was used to brush the call-girl scandal under the carpet. Kaul Singh said the fact that a junior officer of the level of additional director general of police had been asked to conduct probe in matter involving the Chief Minister and an officer of the rank of director general of police, made it obvious that the entire exercise was a cover-up. He accused the Dhumal government of adopting double standards on the issue. A case had been registered on the basis of a doctored CD against Union Steel Minister Virbhadra Singh but in the triple CD case, no action had been taken and the police was trying to find who made the CDs rather than conducting an inquiry on the basis of their content. Other leaders including chief spokesperson Kuldeep Rathore, former MLA Harbhajan Singh and Shimla District Congress (Rural) president Vidya Sagar also addressed the gathering. Similar protests were staged in various district and sub-divisional headquarters. Though the gathering holding anti-government protest was not impressive, the Congress men, including its rank and file from frontal organisations like Youth Congress, Mahila Congress and Seva Dal, participated in the protest and submitted a five-point memorandum to the government, demanding dismissal of the Dhumal government. Local Congress MLA Anil Sharma was conspicuous by his absence despite Congress president Kaul Singh Thakur had made tall claims that the Congress would hold strong protest in all 68 segments in which all Congress leaders would participate. The Congress claimed that protest was held at each assembly block in the district. The Congress men sent a memorandum to the Governor through the SDMs demanding dismissal of Dhumal and suspension of Manhas and Kashyap as they figured in the CDs talking about the alleged money deal and phone tapping. While activist of the CPM protested on the issue of price rise holding both the UPA and the Dhumal-led state government responsible for failure to control prices, Congress activists chose to protest against corruption observing ‘anti-corruption day’ today. The CPM activists staged a dharna in front of the DC office for few hours and later burnt the effigy of price rise at Gandhi Chowk shouting slogans. Later, the activists also marched through the bazaar raising slogans against price rise, central and the state governments. CPM leaders Dr Kashmir Singh, Amin Chand Chauhan, Joginder Singh and Anil Mankotia blamed policies of the Congress government responsible for price rise. They also accused the state government for not taking adequate steps to check prices of essential commodities by strengthening the public distribution system. The CPM leaders also demanded immediate banning of forward trading in foodgrains by abrogating the act allowing the forward trading and strict legal action against hoarders. On the other hand, though the Congress activists held protests at many places to observe the ‘corruption day’ today, top leaders of the district Congress held a protest demonstration at Sujanpur where former MLA Anita Verma, Narinder Thakur and other Congress leaders joined the protest. 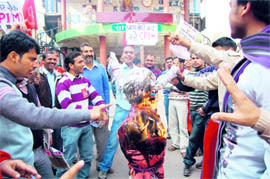 The Congress activists also burnt the effigy of Chief Minister PK Dhumal and submitted a memorandum to the Governor through the local administration. The Congress had demanded dismissal of the Dhumal government and resignation of MP Virender Kashyap after their alleged involvement in corruption as revealed in the CDs, immediate removal of DGP (Vigilance) DS Manhas, CBI probe in the matter and registration of FIR. The Congress leaders at Hamirpur also submitted a memorandum. Stating this while presiding over the meeting with officials, Public Works Minister Gulab Singh said that a meeting would also be held with the Central Ministry of Surface Road Transport and Highways on February 5. The state delegation, headed by him, would include Principal Secretary Public Works, engineer-in-chief, chief engineer national highways and other senior officers of the department. He said the matter regarding improvement of the Ghanouli-Nalagarh road, Daulatpur-Bhera road, Indora-Bhadukhar-Rialli-Hazipur road and construction of Nurpur-Sadwan-Makour-Jamman-Chakki-Bhagatput Dunera road would be taken up with the Punjab government. Keeping in view the increasing volume of traffic from Baddi-Barotiwala-Nalagarh area to Ropar, Chandigarh and Anandpur Sahib in Punjab, matter for widening of the Ghanouli-Nalagarh section would be discussed, he added. A sum of Rs 17.67 crore had already been provided to the ministry for widening and strengthening the road length falling in Himachal Pradesh. Gulab Singh said there was also proposal to construct a bridge across Swan on the Kotla-Amroh in Punjab so that Jaswan constituency of Himachal Pradesh could be directly connected to adjoining Punjab area. Construction of the Indora-Bhadukhar-Rialli-Hazipur road would provide a direct link to Dharamsala and other areas with Jallandhar and Mukerian in Punjab. There was also a proposal to construct express highway from Lalru (Punjab) to Baddi. The government would request the Union Ministry of Surface Transport to declare seven major roads---Tara Devi-Jubbarhatti-Kunihar-Ramshehar-Nalagarh-Kasauli road, Hamirpur-Sujanpur-Palampur road, Bharmour-Chamba-Dalhousie-Pathankot road, Slapper-Pandoh-Chailchowk-Karsog-Tatapani-Dhalli road, Sainj-Lohri-Bangar-Outt-Bagidhar road, Chandigarh-Baddi-Nalagarh-Ramshehar-Arki-Shalaghat road and Brahmpukhar-Bilaspur-Ghumarwin-Sarkaghat-Ladbharol-Baijnath road as national highways. The matter for construction of by-pass through major towns would also be taken up. Other issues to be discussed include maintenance norms, compensation in lieu of deficiency in rail network, flood damage repair funds and pending Central Road Fund proposals. 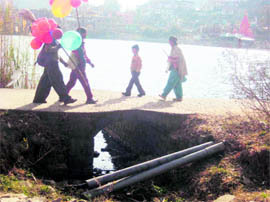 Under the new directions issued by the state government, all officials concerned, especially government agencies like the Public Works Department (PWD), would have to obtain land donations from the residents of the area, whose land would be required for the construction, through gift deeds made in favour of the state government. This step had been taken by the state government as it was facing a large number of litigation in the courts on this issue and the Himachal High Court had sought a clarification from it on this issue after which the PWD Secretary had filed an affidavit in the high court. Road construction in many parts of the state was also stuck up for several years as local people had been approaching the courts and had secured court orders for stay on the construction. Since road construction in the state has witnessed a spurt in the past few years with thousands of crores earmarked for it by the central and state governments under the Pradhan Mantri Gramin Sadak Yojna, construction of roads has become one of the top priorities of the government. However, in a large number of cases, local residents were not coming forward in allowing construction of roads through their private lands, delaying the construction for several years. In many cases, the local residents had secured court orders when road construction was in advance stages and huge money had already been spent on it, depriving the people of real benefits of connectivity. The objection by local residents to pass through the roads through their land also had serious legal implications as in the absence of donation of land through gift in favour of the state government, construction on private land is termed as encroachment, inviting legal action. They submitted a 13-point charter of demands through Mandi ADM to Chief Minister PK Dhumal and urged him to implement them to control prices in the state. Staging a protest rally in the town, CPM district secretary Bhupender Singh and CPI district secretary Lalit Thakur led the anti-price rise demonstration. The Left leaders held the present BJP government in the state and the UPA government at the Centre responsible for the price rise which had made living of the a common man miserable. They demanded that the demand charter should be implemented to ease the crisis being faced by the people in the state by increasing the annual food budget from the present Rs 90 crore to Rs 300 crore per annum. Bhupender Singh stated that ration cardholders should get cheap ration, including 35 kg of rice and atta, regular supplies of sugar at fair price shop at one go so that they do not have to spend seven to 10 days in getting their quota. The state government should provide 10 kg of rice and atta at the rate of Rs 9 and Rs 8 per kg, respectively, to people under the drought relief, he added. The CPM said the government should provide mid-day meal funds to schools so that teachers did not have not to pay for it through their pockets. The state government should pressurise the Centre to increase the state quota rather than decreasing the present quota of 90,000 metric tonnes, they demanded. “More so, if this money was unspent, it could have been deposited with the Ministry of Defence and then double the amount would have been received back in its lieu,” he added. The Hamirpur Deputy Commissioner, who is acting as director of Himachal Pradesh State Sainik Board, today issued a clarification regarding the allegations of state ex-servicemen league. He said Rs 1 crore in question was the unspent money from the National Security Relief Fund. The decision to transfer the money to the Chief Minister Sainik Welfare Fund was taken at a meeting of the state sainik board held under the chairmanship of the Himachal Pradesh Governor on July 23 last year. He also maintained that the money would be used for the welfare of ex-servicemen and not spent for any other purpose. However, outgoing president of the state ex-servicemen league Vijay Singh Mankotia has stuck to his allegations. He alleged that the state sainik boards had been formed under directions of the Union Ministry of Defence. The boards functioned under the respective Governors of the state. At the meeting of the board, the serving GOC took part. The Minister of Defence contributed 50 per cent budget of the sainik boards. Rules and regulations were laid for giving assistance to ex-servicemen under constitution of the board, he said. Besides the board, the other valid body formed for the welfare of ex-servicemen at the state-level was the department of sainik welfare. However, over a period of time, politicians have tried to erode the authority of the constitution board. Former Chief Minister Virbhadra Singh formed another ex-servicemen welfare board in the state, the appointees for which are generally political. “It is for the first time that I am, as the president of ex-servicemen league, listening of another fund mentioned as Chief Minsiter’s Sainik Welfare Fund. As per my knowledge, the funds that are given by the Union government to the state sainik boards cannot be diverted to any other organisation,” he said. Ex-servicemen also alleged that while in sainik welfare board rules had been specified for distribution of funds, in the said CM’s Sainik Welfare Funds, the money would be distributed at political whims. “It has based its entire so called development on totally false and fabricated propaganda,” said BSP state vice-president Dr SR Chauhan while addressing a district-level meeting of the party at the Circuit House here today. Chauhan said it had become very difficult for a common man to take a square meal in a day and he had been reduced to a virtual slave of politicians who were making a serious attempts to stick to power by hook or by crook. He said both the Congress and the BJP leaders were hand in glove with hoarders in the state and added that all BSP members must take a vow to change this situation. The BSP would soon start a state-level agitation to expose leaders of both these parties in the state, he added. Prominent leader Anoop Chand Bhatia, Amar Nath Sinduria, Surendra Kumari, Lashkari Ram and Anil Kishore were present during the occasion among others. The programme was a part of the second phase of the agitation against price rise, which will culminate with a national rally at Delhi on March 12. The protesters raised slogans against both the Centre and the state government and blamed the neoliberal economic policies for the unprecedented rise in the prices of foodgrains. Secretary of the Shimla district unit of the party Sanjay Chauhan, while addressing the gathering here, accused the BJP government of being soft on hoarders. He warned that in case the government failed to take effective steps to contain price rise the party activists would not hesitate to gherao the shops and ration depots indulging in hoarding and other malpractices. He criticised the BJP government for raising the rates of subsidised ration being supplied through the public distribution system and demanded immediate roll back of hike in the rates of urad dal. It had failed to ensure adequate supply of cooking gas (LPG) as a result of which there was a shortage of 1.48 lakh refills. The party demanded forward trading in food items be stopped immediately. Other demands included universalisation of PDS to help provide 35 kg of foodgrain every month to each ration card holder at Rs 2 per kg, transport subsidy to the tune of 10 per cent, restoration of rice quota, immediate processing of the 9 lakh tonne of imported raw sugar and inclusion of protection of agriculture crops from wild animals. Technical education is being given priority with a hike of 78 per cent in the budget allocation. The past two years saw a number of prestigious institutions like the IIT at Mandi and Institute of Fashion Technology at Cheb in Kangra come up in the state. The state government has granted approval for opening of 16 universities in the private sector, besides a technical university, eight engineering colleges, eight pharmacy colleges, 15 polytechnic colleges in private sector and one polytechnic college have been opened in the government sector. The government is also developing the “Atal Shiksha Kunj” at Kalu Jhanda in the Baddi area of Solan where educational institutions of repute will come up. A sum of Rs 62 crore is being spent on setting up five polytechnic institutions in Kinnaur, Sirmour, Bilaspur, Kullu, Lahaul and Spiti districts. The government plans to open a hydro-engineering college at Bilaspur in a joint venture of the National Hydro Power Corporation and the National Thermal Power Corporation. An Institute of engineering and technology will be opened at Pragatinagar in the near future with the assistance of the Satluj Jal Vidyut Nigam. The government has also approved the introduction of two new courses in B.Tech in government engineering college, Sundernagar, from academic session 2010-11. Further, 11 industrial training institutes have been upgraded to “Centre of Excellence” by spending an amount to the tune of Rs 32.50 crore. Besides, 27 industrial training institutes have also been upgraded in public-private participation by spending a whopping sum of Rs 50 crore. Employment cells have been established in all vocational training institutions and 39 industrial training institutes have been brought under the “modular employable scheme” with a budgetary provision of Rs 233 lakh. Dr Anil Chouhan, principal, Tanda college, said 10 professors from departments of ophthalmology, paediatrics, community medicines, orthopaedics, surgery, pharmacology, anaesthesiology, gynaecology and dermatology from different medical colleges of the country would inspect the respective departments for giving them clearance to run the postgraduate courses. Dr Chouhan said nearly 10 associate professors of different departments were appointed against the vacant posts in the past fortnight and almost all required vacancies had been filled according to the norms of the MCI. He was hopeful that the courses would start from the coming academic session as the required infrastructure, manpower and machinery was available. He said the entire process to get the institute recognised to run the courses was expedited because of the efforts of Health Minister Rajeev Bindal. Meanwhile, Bindal told The Tribune that the state government would spend Rs 150 crore to provide specialised healthcare for the people of this region. He said five medical colleges would be opened in the state in private sector, which included one medical college at Palampur. He said the Mahila Gram Panchayat Swasthya Sahaika Yojan had been started in the state to strengthen healthcare services at panchayat level. Dr Bindal said the national health insurance scheme was being implemented throughout the state after its successful implementation in two districts — Kangra and Shimla — earlier. Under this scheme, more than 2.98 lakh families living below the poverty line would get health insurance cover of Rs 30,000 each. The Tibetan envoys arrived back in New Delhi after meetings with Chinese government representatives in the central state of Hunan and Beijing. The envoys — Lodi G. Gyari and Kelsang Gyaltsen — are expected to reach Dharmsala today to brief the Tibetan prime minister-in-exile Samdhong Rinpoche on the details of their meetings. The sources here, however, refused to divulge details of the meeting. They also told The Tribune that the Chinese government had reportedly scheduled a press briefing for Tuesday on the talks. The Tibetan government-in-exile is likely to give its reaction to the talks only after listening to the Chinese government’s response. The envoys of the Dalai Lama left for China last week to reopen talks after a break of 15 months. They were accompanied by senior assistants Tenzin P. Atisha, Bhuchung K. Tsering, both members of Tibetan task force on negotiations, and Jigmey Passang from the secretariat of the Tibetan task force. The talks collapsed after the eighth round of talks in November, 2008, ended without any progress. The talks were stalled after a “Memorandum on Genuine Autonomy for the Tibetan People” submitted by the Tibetan side at the eighth round of talks was rejected by the Chinese government. The latter termed it as demand for “half-independence” and “disguised independence” or “covert independence”. The Tibetan side, however, maintained that articles of the proposed memorandum were prepared in accordance with the provisions of the constitution of the People’s Republic of China and its laws on national regional autonomy. The talks also assume significance in view of proposed visit of the Dalai Lama to the US later this month. It was being expected that the Dalai Lama would meet US president Barack Obama. Last year, Obama had not met the exiled Tibetan leader as the latter had visited just before the visit of the US president to China. This move had evoked strong reaction from the Tibetans-in-exile and admirers of the Dalai Lama. The Tibetan prime minister-in-exile went to the extent of describing the US as a country of traders. The demonstrators held both central and state governments responsible for this very serious and “calculated lapse” which had made the life of common man most miserable. While addressing the rally, leaders said both governments cannot escape their respective responsibilities in this matter and were behaving in a criminal manner by holding each other responsible for this price rise, but without itself doing anything to meet the challenge and ease the situation. They demanded that the BJP and the Congress leaders of the state must come forward to tell people what they themselves have done to control prices in Himachal Pradesh. They were critical of the role of hoarders and black marketeers and mercenaries, who they said were hand in glove with the state BJP government and the Congress-led government at the Centre. They expressed surprise that this inordinate price rise was not in any way benefiting farmers but thousands of crores of this money was being pocketed by intermediaries, colluding ruling politicians and the stock holding sharks. The demonstrators also burnt effigies of both state and central governments at the Shahid Kumari Champa park in the main market. Those present included prominent leaders Shyam Lal Thakur, Sita Ram, Ram Lal, Ram Lok Thakur, Niraj Basu, Pankaj Sharma and Lakhbir Singh. Congress leaders and workers submitted memorandums to the respective sub-divisional Magistrates at Manali, Kullu and Banjar. They demanded dismissal of the state BJP government with immediate effect due to the recent CD episode. Meanwhile, SP KK Indoria said the police had made arrangements to thwart plans of the Congress men and were successful. He agreed that the police had to toil hard to maintain the law and order. Uttam Ram Sharma, block president of Kullu, said the Congress had planned peaceful agitation but the police used force against them. Chief Parliamentary Secretary Satpal Satti, while presiding over the meeting of the state-level advisory committee on youth programme (SACYP) here today, said about 150 youths from Jammu and Kashmir, Haryana, Punjab, Rajasthan, Andhra Pradesh and Himachal would participate in the camp. He said purpose of the camp was to bring youths together, motivate them for engaging in social service and above all promote harmony and oneness among them, irrespective of the gender, class, castes and religion. The young participants from different states would get an opportunity to share their thoughts and develop better understanding about each other and their distinct cultures, he added. Spokesperson of the party Ashok Kapatia said the Congress was blowing up the issue beyond proportions just to divert attention of the people away from the burning issue of price rise. He alleged that it was a ploy of the party to raise hurdles in the way of the drive launched by the BJP government in the state against corruption. The fact was that the popularity of the Congress had nosedived in the wake of unprecedented price rise and anti-people policies being pursued by the UPA regime. The rate of atta had doubled from Rs 10 to Rs 20 per kg, and that of pulses had trebled and hovering around the three digit figure. Sugar at Rs 45 per kg had become unaffordable even for the rich. In such a situation it was hardly surprising that the Congress was indulging in such gimmicks to sidetrack the main issues. He advised the Congress to burn the effigies of “spiralling prices” and agitate for the rights of the state. As many as four fire tenders, two each from Baddi and Nalagarh, were pressed into service to douse the flames which took more than six hours to be controlled. Since the material, which was stocked in the unit, comprised synthetic polyester and other inflammable garment-manufacturing material the fire spread within no time. Though some workers were present at the time of the fire, the unit was immediately vacated and no loss of life was reported. The tipper was coming from Dharwala to Choori when the mishap took place. Soon after receiving the information about the accident, the police rushed to the accident site and extricated bodies of the deceased from the waters of the Ravi. Secretary of the board HR Sharma said today that exemption from BEd degree had been granted to all applicants in the Science stream whether they were working as lecturers in government schools or colleges on contract/PTA basis or were serving as lecturers in private schools and colleges. Sharma said the written test for these posts would be held on February 7. He said the same recruitment rules applied to both Science and Arts candidates. He further said postgraduates in Arts serving as lecturers in government and private schools and colleges too had been given exemption from BEd degree for the post of lecturer in the Education Department.